Five years of civil war have led to widespread human rights violations, and large scale internal displacement and refugee outflow to Sudan and Uganda. Despite a peace agreement clashes continue, causing further displacements. Intercommunal violence is widespread, with cattle raids a common source of tension, particularly between pastoralist communities. Over 4.5 million people are estimated to be displaced, including 1.91 million IDPs and 2.47 million South Sudanese refugees. ? Of the 1.91 million IDPs in South Sudan, 194,747 people live in Protection of Civilians (PoC) sites. ? The main rainy season from June-September has a significant impact on road access. Attacks and ambushes on humanitarian convoys severely hamper the delivery of assistance and access to populations in need. ? In 2017, a total of 1,160 access incidents were reported and in 2018 a total of 670. 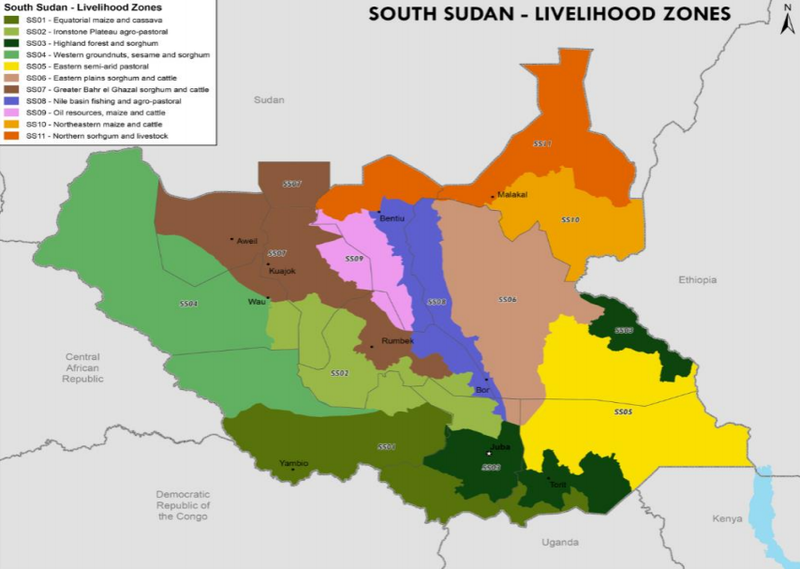 Severe food insecurity persists across South Sudan, affecting 6.1 million people. Critical malnutrition levels are reported in 31 counties. The main drivers of food insecurity are conflict and displacement, which have led to disruptions of food production, livelihoods and humanitarian assistance, as well as a deterioration of the economy. ? Market activity is minimal in conflict-affected areas. INFORM measures South Sudan's risk of humanitarian crisis and disaster for 2019 to be very high, at 8.9/10, down from 9/10 in 2018. 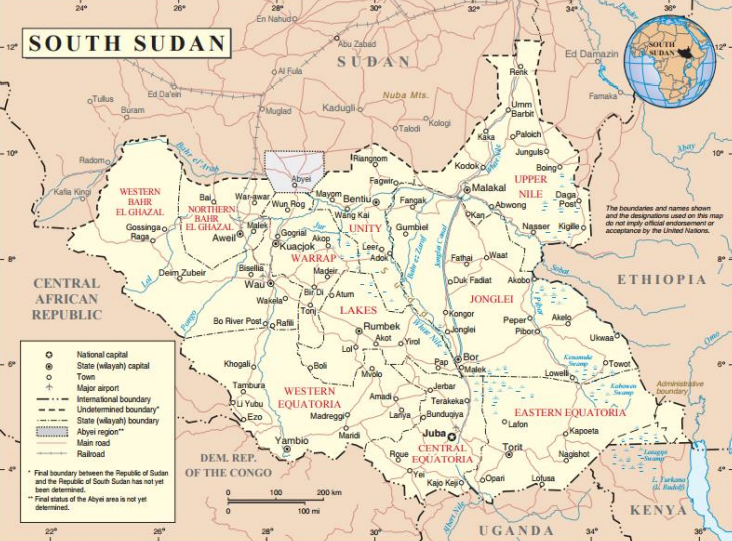 South Sudan's vulnerability is measured at 9.2/10. 28/03: Up to 10,000 internally displaced people and returnees from DRC who recently arrived at Nyori camp, Lasu payam, Yei River State have been without access to humanitarian assistance since January.? 28/03: A lack of water since February has been reported from Mangateen IDP site in Juba, where 8,000 people are sheltered. IDPs are resorting to pump water, which is salty and unfit for drinking. Food, healthcare and education services are also lacking. ? 06/03: More than 3,000 people have been displaced following fighting between herders and farmers on 6 March in Kwajina county, Wau. Two people were killed in the clashes and incidents of sexual abuse have been reported. ? 28/02: 142,000 South Sudanese refugees have been reported to have returned from Uganda, Ethiopia, Sudan, Kenya, CAR, and DRC, of which 22,000 returned between September 2018 and January 2019. ? 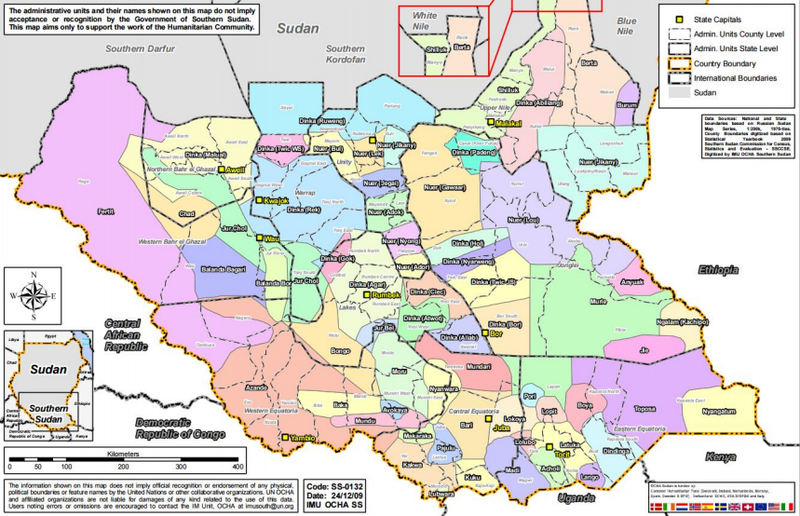 22/02: An estimated 6.4 million people face severe food insecurity (IPC 3 and above), of which 45,000 people face IPC 5 in Canal/Pigi and Pubo (Jonglei), Panyikang (Upper Nile) and Cueibet (Lakes). This figure represents a 13 per cent increase compared to the same period last year. The situation is expected to deteriorate at the peak of the lean season between May and July. The main drivers of food insecurity continue to be localised conflict, poor rainfall, population displacement and consecutive years of asset depletion. ? Food security: Conflict and violence have disrupted agricultural activities and trade flows leading to low availability and record high food prices. Health: Health services are overstretched and have very limited capacity: there is a severe shortage of medical personnel and medicine, and conflict affects access. Malaria is a leading cause of morbidity. Protection: Civilians are regularly subjected to human rights violations including sexual violence, torture, forced recruitment and abduction from both opposition and government forces. During the rainy season (May to October), a large part of South Sudan is inaccessible due to the poor state of roads, limiting data on displacement on population needs. Lack of information regarding the number of displaced people in host communities and the needs of host communities. Limited information on needs of refugees in-country. While there are reports of people moving to neighbouring countries in search for food, there is limited information on population movement driven by food insecurity in-country. Lack of information on returnees and their needs.